I-Mockery.com | Weekly Spotlight - ¡Three Amigos! Plot: Three unemployed silent movie actors head to Mexico to entertain a small village. What the actors don't realize is the villagers believe they are real gunfighters who can save them from the outlaws that have been terrorizing them. Review: Why does this movie have such a bad reputation? Personally, I think it's a criminally underrated comedic gem showcasing some of the best work that Steve Martin, Chevy Chase and Martin Short have to offer. They play three out of work actors who get called down to a small village in Mexico to perform as their on-screen characters... or so they think. After they've been in town for a few days, they quickly realize that they weren't called up to perform, they were called to battle some Mexican bandits led by the ruthless El Guapo. With no jobs and no friends, the three of them must now decide whether to run away like cowards or to become the Three Amigos for real and save the small village. -The three perfect character names: Lucky Day, Ned Nederlander and Dusty Bottoms. -The opening theme song where they sing one high note for a ridiculously long time. -Watching the amigos perform "My Little Buttercup" in front of a highly intimidated seedy bar crowd. -Dehydrated in the middle of the desert, each of them taking a sip from their canteens. Lucky has a tiny bit left, Ned's is filled with sand, and Dusty has more than enough, which he wastes and discards while the other two look at him in disbelief. -El Guapo gets a sweater from his gunfighting compadres. -The turtle wishing Ned goodnight. -Summoning the invisible swordsman and then accidentally killing him. There are so many scenes from Three Amigos that have stuck with me over the years. I watched the movie countless times when I was a kid and it still holds up today. It's just plain stupid fun, and if you can't laugh at a movie like this, then you're taking it far too seriously. 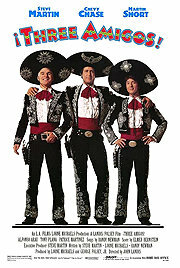 The Three Amigos gave me many laughs and will do the same for you if you let it. One might even say the movie will give you a plethora of laughs. So join the amigos as they take a stand for wherever liberty is threatened, do the classic Three Amigo salute and ride on off into the sunset. Perfect summing up of the highlights, I always liked this movie for being a nice parody of the Seven Samurai / the Magnificent Seven. I loved watching this movie on VHS when I was growing it. Coincidentally, it was great practice for Chevy Chase. Rog, I was wondering if you knew what plethora means? Cause I'd hate to think that you used the word without knowing the meaning. This movie is an A+ comedy. i loved this movie growing up as well. i still occasionally throw "sew! sew like the wind!" into converations with my sister. she was a big fan, too. I adore this movie. It was one of the first ones I bought on DVD. "Caw, caw, hey, hey, hey you, hey you two, two, whipperwill, whipperwill, lookuphere, lookuphere.... HEY GUYS!" To this day I occasionally get "My Little Buttercup" in my head. Especially if there are tense situations or long silences. All I need to do now is learn the dance and I will be perfect. I used to enjoy this movie a lot when I was younger. I don't think I've watched it too recently since as I got older the more Martin Short makes me sick...I'm sorry people he's not funny. "Everyone has their El Guapo. For some, shyness is their El Guapo. For some, illiteracy is their El Guapo. For the citizens of this town, their El Guapo happens to be the real El Guapo." "I was thinking later, you could kiss me on the veranda"
The first time I'd ever laughed uncontrollably in a movie theater was during the scene with the singing bush. Great movie, and it's one I can't wait to show my kids when they are old enough. What? No it isn't. Have you seen either of those movies? I've never heard anyone say anything bad about it, so I was unaware it apparently gets a bad rap? I have never met anyone who didn't like it either, maybe he meant bad reviews from critics. There are definitely plenty o' critics who didn't think it was very entertaining, but I also knew a bunch o' people in college who thought it was, in their words, "lame". This, of course, boggled my mind since I thought it was a hilarious flick. Doesn't exactly have the best rating on IMDB either... so yeah, there are obviously people out there who just don't like it. But as they say, you can't please everybody. Especially people in college with their lattes and cellphones an books. Well we really dont have a plan B. We didn't expect for the first plan to work. Sometimes you can overplan these things. A real classic. I wonder what you think about the upcoming remake(basically) "Tropic thunder"? Ben Stiller, Jack Black, and Robert Downey Jr are the new "Amigos". I must preserve my P.B.F. I'm not one to listen to much for critics, and I too have not heard anything bad about this movie. I for one like this movie so much that if i had a safe i would surely put it there. I'm puzzled that anyone could not like this movie. But then, I'm also puzzled as to why people hate Little Nicky so much. People simply don't understand this level of sophisticated comedy. There are simplistic jokes and one liners on the surface, but the subtlety is what makes all of that worth it. Basically it's a Mel Brookes movie without mel, and because the majority of movie viewers are sheep who never truely watch a movie and merely base their opinion on what they are told it should be, some people didn't like it simply because they weren't TOLD to like it. It wasn't a block-buster smash, so my guess is those who told you it was "lame" never actually watched the film and were to embarrassed to admit it. As for film critics, well they are almost always wrong, heralding crap-fests, and hating quality movies. So any critical analysis should promptly be ignored. This movie is one of the greatest classics ever made. Rog - do you know what it means to have a plethora? Ever notice El Guapo was also in The Wild Bunch and El Topo?